Mary Simon (70), a Canadian Inuk, was born in Kangiqsualujjuaq in Arctic Quebec in Canada. Throughout her life, she has worked tirelessly for the development of indigenous affairs. She has fought to improve social and economic Arctic policy and has been commitment to raising international awareness of the High North. Simon was also one of the driving forces behind establishing the Arctic Council. 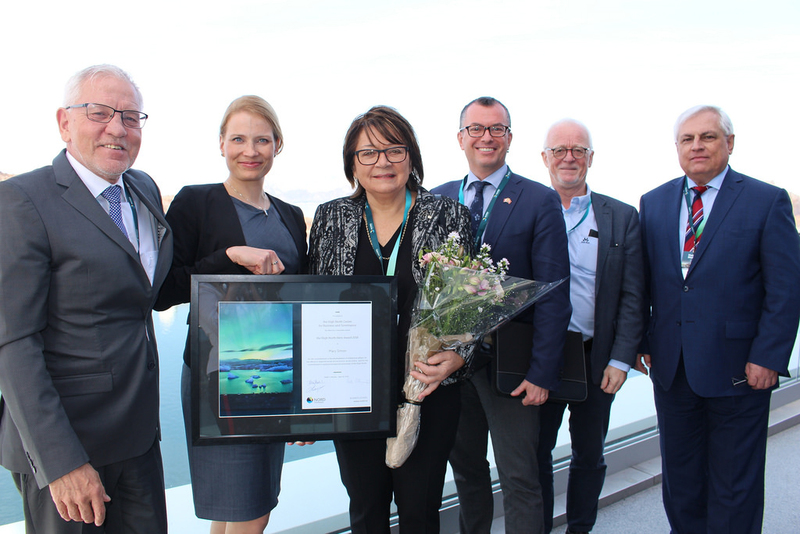 – The High North Hero 2018, Mary Simon, has been outstanding over decades in her engagement for improving the situation, living conditions and welfare of indigenous people of the Arctic. Her contributions have raised international awareness of the Arctic, both of opportunities for value creation and of challenges to succeed in the work to realize these opportunities, states Director of the High North Center for Business and Governance, Frode Mellemvik. – I am very happy about the decision of the High North Hero selection committee, and I know that her work has not only created new ways of thinking and acting in the Arctic, but it has also been an inspiration for those who are engaged in developing the Arctic, for the benefit of both the people living there and of the global society engaged in the resources available in the Arctic, says Mellemvik. Now retired, Simon travelled from Canada to the Arctic city of Bodø in Norway, to receive the award, and there she was celebrated by some 350 conference participants, most of them young people, all with a keen interest in the Arctic. – I am very honored to have been selected for this award. I think it recognizes the importance for all of us to think and work together and act in both a circumpolar and global context as well as at home. I very much appreciate this honor bestowed upon me and by extension the Canadian Inuit, and I am excited to be going to Norway and attend the High North Dialogue conference, says Mary Simon. In her speech to the winner, Director Anu Fredrikson of the Arctic Economic Council said that this year’s winner is described as one of the most important advocates for indigenous people’s rights and culture, and she represented the Inuit in the Canadian government as well as the United Nations. The list of positions held by Mary Simon is impressive. She has been President of the National Inuit Organization, Chairperson of the National Committee on Inuit Education, President of the Land Claims Organization for Inuit of Nunavik, President of the Inuit Circumpolar Council, Canadian Ambassador for Circumpolar Affairs, Founding Chair of the Arctic Children and Youth Foundation, Officer of the Order of Canada and Recipient of the National Order of Quebec; just to mention a few. Simon also has numerous orders and medals, and she has eleven Honorary Doctorates of Law from Canadian Universities. – It is safe to say that Mary Simon is a true High North Hero! 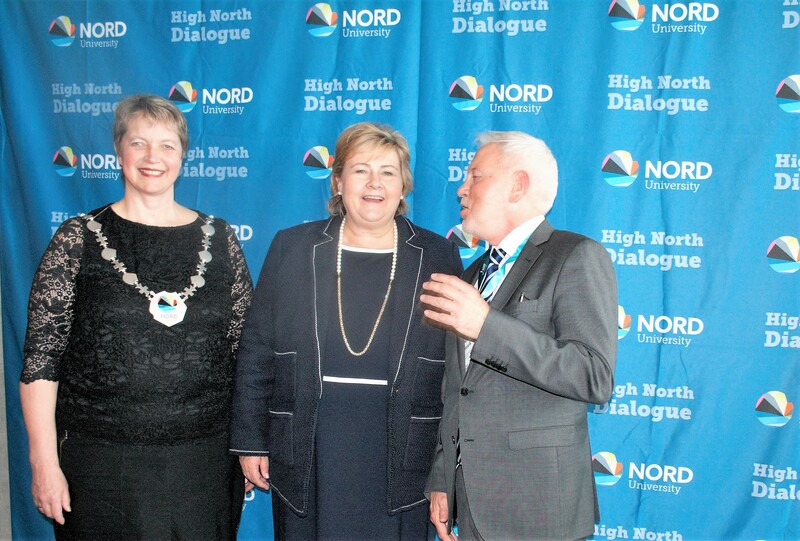 Rector at Nord University Hanne Solheim Hansen at High North Dialogue with Prime Minister of Norway and Director at High North Center, Frode Mellemvik.